1 Effects of Forced and Natural Leaflet Orientation on Transpiration Rates and other Physiological Traits in Soybeans Richard D. Johnson, Fred L. Allen, Carl E. Sams, Vince R. Pantalone and Arnold M. Saxton University of Tennessee, Knoxville, TN USA, www.utk.edu Emails: rjohnsoy@utk.edu, allenf@utk.edu Abstract The objective of this study was to evaluate the effects of natural and artificially imposed leaflet orientation on transpiration rates and other physiological traits in soybeans. The soybean variety USG 5601T was chosen for this study due to its ability to strongly orient its leaves during the day in response to sunlight. Twenty-four plants were subjected to two treatments during the 2007 and 2008 growing season in Knoxville, TN. One treatment set was restrained with netting in order to gently force the orientation of the outer canopy leaves to assume the phenotype of a plant which does not orient its leaves. The other treatment was unrestrained and allowed to orient its leaves as normal. Whole plant transpiration rates of 24 plants for each treatment were measured for a 24 hour period with the Dynamax Flow 32 Sap Flow instrument when the plants were in the R5 growth stage of active pod filling. Photosynthetically Active Radiation (PAR) measurements above and mid-canopy were taken with a Decagon Sunflec Ceptometer. Leaflet temperatures were measured with a Raytek Infrared Thermometer. Supporting data using the soybean varieties USG 5601T (high orientation) and PI416937 (low orientation) were collected in 2006. Leaflet transpiration, stomatal conductance, PAR, and photosynthesis and were obtained with the Dynamax LCi Photosynthesis meter. The unrestrained plants, which oriented their leaves, used an average of 24 grams of water more per day than the restrained plants which were not allowed to orient their leaves. Although this effect was not significant (p=0.53) it is consistent with previous findings that soybean plants with a high degree of leaflet orientation transpire more water than plants with lower degrees of leaflet orientation (Johnson et al., 2004, Johnson et al., 2006, Johnson et al., 2009). This trend has been indicated with grafting, near-isogenic, and population line studies. High leaflet orientation allows upper canopy leaflets to maintain an average 4.5°C lower temperature due to their reduced sunlight exposure. This may result in a lower transpiration rate for those upper canopy leaflets. However, soybean plants with high leaflet orientation allow more sunlight into the lower canopy which results in higher rates of transpiration, stomatal conductance, and photosynthesis for those leaves relative to plants with lower leaflet orientation. The overall effect appears to be that soybean plants with higher leaflet orientation tend to have higher overall rates of transpiration, photosynthesis, and yield. Additional data analysis on large population sets are planned to further address the effects of the leaflet orientation trait on water use and yield in soybeans. Introduction Inadequate moisture during flowering and seed-fill is a yield-limiting factor to soybean production throughout most soybean growing regions of the world. Drought tolerance is therefore a highly desired trait in soybean varieties. However, drought tolerance is a complex response and is determined by the interaction of several traits (and genes) in the plant with the environment. Research conducted at the University of Tennessee has demonstrated that soybean varieties differ in their ability to orient their leaves during the course of the day (Wofford and Allen, 1982). For some varieties, the leaf surface remains very flat relative to the position of the sun, even during the hottest part of the day (low leaflet orientation). Other varieties move their leaves during the course of the day such that the leaves have maximum exposure to the sun in the early and late parts of the day, but during mid-day the leaves are oriented such that the surface of the leaves has reduced exposure to direct sunlight (high leaflet orientation) (Fig. 1). In a study of the variety Essex (high leaflet orientation) and Dare (low leaflet orientation), the two varieties produced about equal yields; however Essex had cooler leaves and used about one-half the amount of water as Dare during the growing season (Paris, 1997). Later studies using reciprocally grafted soybeans, near-isogenic lines and population lines indicated that plants with high leaflet orientation may have higher transpiration rates, water use efficiencies, and seed yield (Johnson et al., 2004, Johnson et al., 2006, Johnson et al., 2009). In order to reduce differences due to genetic factors other than leaflet morphology, a single, highly homozygous, variety with high leaflet orientation (USG 5601T) was used in this study to evaluate the effect of leaflet orientation on whole plant transpiration. Figure 1. Differences in leaflet orientation at different times of day. USG 5601T PI 416.937 8 am 2 pm Figure 2. Unrestrained Treatment Restrained Treatment High Leaflet Orientation Low Leaflet Orientation Materials and Methods This experiment was conducted at Knoxville, TN USA (35.96 lat., 83.91 long.) during the 2007 and 2008 growing seasons using two bordered rows of the high leaflet orienting soybean variety USG 5601T. One row was restrained with netting in such a way as to gently force the orientation of the outer canopy leaves to assume the phenotype of a plant which does not orient its leaves (Isoda et al, 1994). The other row was also covered with the same netting however, the netting was suspended so it did not restrain the leaflets (Fig. 2). Twelve plants on each row were measured for a 24 hour period using the Dynamax Sap Flow32 system in order to obtain whole plant transpiration rates. Measurements were taken when the plants were in the active pod filling stage of growth (R5). Additional measurements were taken immediately afterwards by switching the netting treatment from one row set to the other, for a total of 24 observations of each treatment, each year. PAR measurements above and mid-canopy were taken with a Decagon Sunflec Ceptometer. Leaflet temperatures were measured with a Raytek Infrared Thermometer. Leaflet transpiration, stomatal conductance, PAR and photosynthesis data for USG 5601T and PI416937 (low leaflet orientation) were obtained for upper and mid-canopy leaflets by measuring eight unrestrained plants of each line with the Dynamax LCi Photosynthesis meter in 2006. All data were analyzed with the Statistical Analysis System (SAS, version 9.1.3). Results and Discussion The unrestrained plants, which oriented their leaves, used an average of 24 grams of water more per day compared to the restrained plants which were not allowed to orient their leaves (Table 1). Although this effect was not significant (p=0.53) it is consistent with previous findings that soybean plants with a high degree of leaflet orientation transpire more water than plants with lower degrees of leaflet orientation (Johnson et al., 2004, Johnson et al., 2006, Johnson et al., 2009). This trend has been indicated in studies involving grafted plants, near-isogenic, and population lines. High leaflet orientation allows upper canopy leaflets to maintain an average 4.5°C lower temperature due to their reduced sunlight exposure (Table 2). This may result in a lower transpiration rate for those upper canopy leaflets (data not shown). However, soybean plants with high leaflet orientation allowed more sunlight into the lower canopy which resulted in higher rates of leaflet transpiration, stomatal conductance, and photosynthesis for those leaves relative to plants with lower leaflet orientation. Rates of each measured characteristic decreased more significantly in the mid- canopy leaves of plants with lower leaflet orientation (Tables 3 and 4). 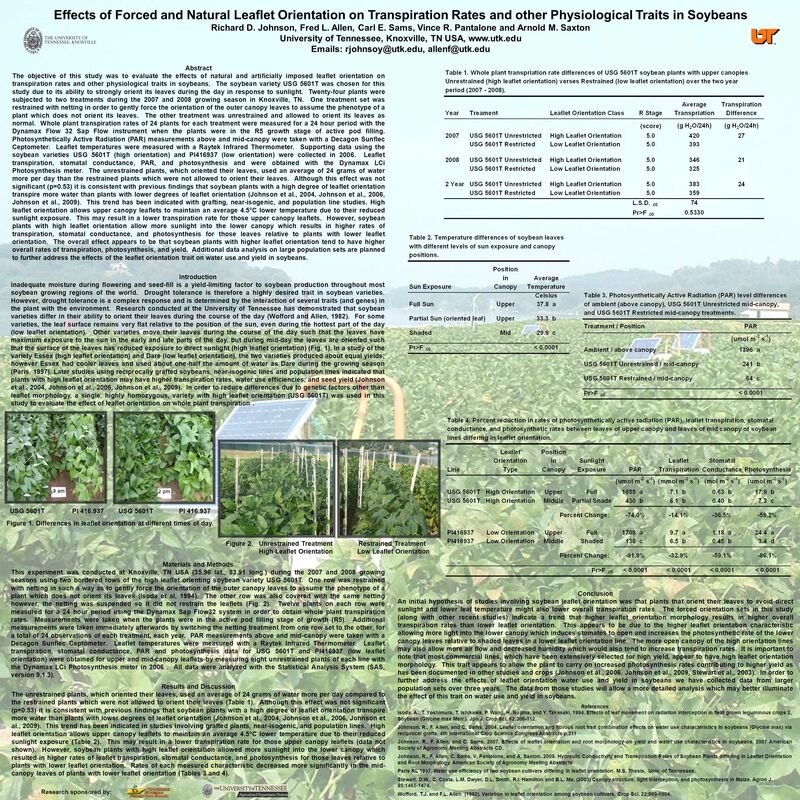 Research sponsored by: Conclusion An initial hypothesis of studies involving soybean leaflet orientation was that plants that orient their leaves to avoid direct sunlight and lower leaf temperature might also lower overall transpiration rates. The forced orientation sets in this study (along with other recent studies) indicate a trend that higher leaflet orientation morphology results in higher overall transpiration rates than lower leaflet orientation. This appears to be due to the higher leaflet orientation characteristic allowing more light into the lower canopy which induces stomates to open and increases the photosynthetic rate of the lower canopy leaves relative to shaded leaves in a lower leaflet orientation line. The more open canopy of the high orientation lines may also allow more air flow and decreased humidity which would also tend to increase transpiration rates. It is important to note that most commercial lines, which have been extensively selected for high yield, appear to have high leaflet orientation morphology. This trait appears to allow the plant to carry on increased photosynthesis rates contributing to higher yield as has been documented in other studies and crops (Johnson et al., 2006, Johnson et al., 2009, Stewart et al., 2003). In order to further address the effects of leaflet orientation water use and yield in soybeans we have collected data from larger population sets over three years. The data from those studies will allow a more detailed analysis which may better illuminate the effect of this trait on water use and yield in soybeans. References Isoda, A., T. Yoshimura, T. Ishikawa, P. Wang, H. Nojima, and Y. Takasaki. 1994. Effects of leaf movement on radiation interception in field grown leguminous crops 2, Soybean (Glycine max Merr.). Jpn J. Crop Sci. 62:306-312. Johnson, R., F. Allen, and C. Sams. 2004. Leaflet orientation and fibrous root trait combination effects on water use characteristics in soybeans (Glycine max) via reciprocal grafts. 4th International Crop Science Congress Abstracts p.311 Johnson, R., F. Allen, and C. Sams. 2007. Effects of leaflet orientation and root morphology on yield and water use characteristics in soybeans. 2007 American Society of Agronomy Meeting Abstracts CD. Johnson, R., F. Allen, C. Sams, V. Pantalone, and A. Saxton. 2009. Hydraulic Conductivity and Transpiration Rates of Soybean Plants differing in Leaflet Orientation and Root Morphology. American Society of Agronomy Meeting Abstracts Paris RL 1997. Water use efficiency of two soybean cultivars differing in leaflet orientation. M.S. Thesis, Univ. of Tennessee. Stewart, D.W., C. Costa, L.M. Dwyer, D.L. Smith, R.I. Hamilton and B.L. Ma. (2003) Canopy structure, light interception, and photosynthesis in Maize. Agron J. 95:1465-1474. Wofford, T.J. and F.L. Allen (1982). Variation in leaflet orientation among soybean cultivars. Crop Sci. 22:999-1004. Download ppt "Effects of Forced and Natural Leaflet Orientation on Transpiration Rates and other Physiological Traits in Soybeans Richard D. Johnson, Fred L. Allen,"
Do In and Post-Season Plant-Based Measurements Predict Corn Performance and/ or Residual Soil Nitrate? Patrick J. Forrestal, R. Kratochvil, J.J Meisinger. Corn (Zea mays L.) Leaf Angle and Emergence as Affected by Seed Orientation at Planting Guilherme Torres, Jacob Vossenkemper, William Raun, John Solie. Effects of Salt Stress on the Stem Length of Arabidopsis thaliana Jacob Phillips Undergraduate Student Biology Health Sciences Concentration Department. The transferring and management of water and nutrients, and the mechanism of productivity in rice paddy ecosystem Weijun Zhou, Kelin Wang, Kairong Wang. Responses of Sweet Cherry Productivity and Soil Quality to Alternate Groundcover and Irrigation Systems Xinhua Yin 1, Xiaolan Huang 1, and Lynn Long 2. Determine seeding rate and hybrid effects on: Phenotypical and physiological plant measurements Canopy and leaf sensor measurements A goal in precision. Soybean Yield, Management and Physiology: Comparison To Corn North Central Branch, ASA March 16-17, 2005 Emerson D. Nafziger Crop Sciences University of. Grape Physiology Section 3 Stomata Photosynthesis. Climate-induced changes in erosion during the 21 st century for eight U.S. locations. Results and discussion Results and Discussion Figure 3. Observed (symbols) and simulated (lines) V-Stages of soybean cultivars (MG 3.0 to 3.9) grown at. Nitrogen use efficiency (NUE) for cereal production worldwide is approximately 33% with the remaining 67% representing a $15.9 billion annual loss of Nitrogen. UV and Insect eyes. LIGHT &PHOTOSYNTHESIS Spectrum. Solar irradiance of world Factors contributing to geographic distribution of three Marsilea spp. 影響三種田字草地理分佈的因子探討 Tai-Chung Wu 1, Wen-Yuan Kao 1,2 1 Institute. Module X: Soil Moisture Relationships and Irrigation Lesson 2: Irrigation in Chili Pepper Cultivation After completing this lesson, you have learned to. A Case Study of Crop Model Applications in an Increasing Diversity of Genetically Modified Traits Girish Badgujar 1, V.R. Reddy 1, K. Raja. Reddy 2, David. LEARNING GOAL #1LEARNING GOAL #2LEARNING GOAL #3 Students will understand that: phenotypic variation has genetic and environmental components; inheritance. To Mulch Or Not To Mulch:. COMPARING BROCCOLI PRODUCTIVITY IN MULCHED AND UNMULCHED AREAS IN NAZARE PAULISTA.